Christ Church is a Grade II listed multi-purpose event and conference venue situated in the heart of Woking. Our flexible spaces can accommodate up to 300 people in a single space and can be adapted to fit all event requirements. Our team is here helping house, support and transform local people, organisations and businesses through offering them a central location where they can impact their local sphere of influence. Our Nave has a maximum seating capacity of 300 people in a theatre style, and houses state-of-the-art Sound and AV Equipment. Natural light streams through the 19 arched windows onto the ground floor making the Nave a warm, bright space. Click here for more details. Built in 1991 as part of the last major refurbishment to the internal structure, the Gallery has become a ‘go-to’ space for local community and business use. As you walk into the room, you cannot help but be amazed by the stained glass windows and the large oak beams across the ceiling. Click here for more details. Bursting with natural light, our Skylight room offers you an open, spacious environment for both yourself and your colleagues. Click here for more details. 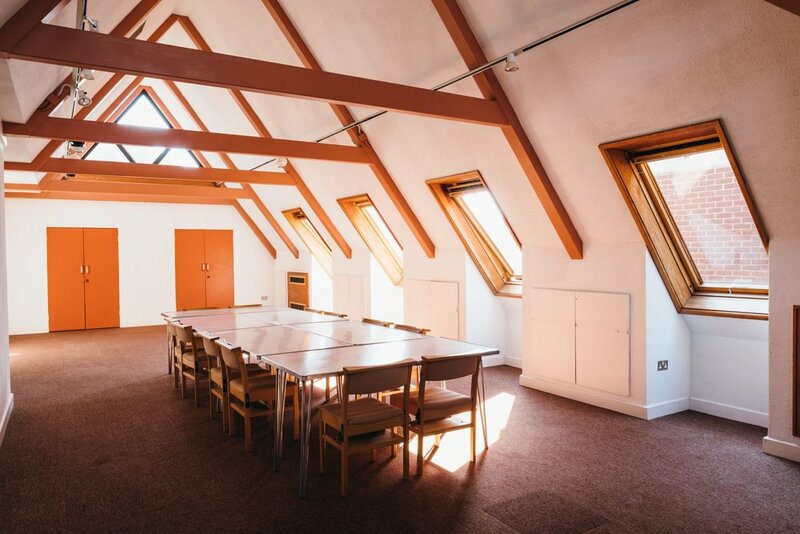 The Octagon beautifully combines the views of the bustling town centre with the tranquillity of our meeting space, and leaves clients with an experience that they could not find anywhere else. Click here for more details. The Forum is our smallest and most affordable space available to hire. This makes it one of our most popular and sought after rooms. Click here for more details.